I had been hearing how great this series was for a very long time when I bought this Omnibus. I always doubted the hype around it for the strange characters and the cartoony art. Then when I was at a local small Comic Fest in Portland and saw it on sale for $40 (normally $125) I finally gave it a chance. 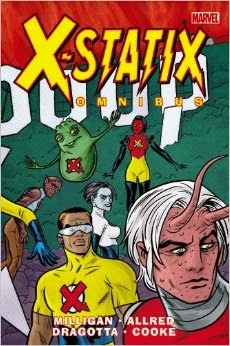 X-Statix actually started as X-Force #116 in 1991 and ran for 14 issues before changing the name to X-Statix. With Peter Milligan and Mike Allred picking up the reins after the iconic Rob Liefeld era. Say what you want about Liefeld, but his run on X-Force was the standard for all X-Force books to come for a quite awhile. I believe that has to be understood to fully understand why this series so great. In the first issue you are introduced to a completely different X-Force team. Without any mention of the X-Force team that was in X-Force #115. You are thrown into the story of a team of twenty something heroes calling themselves X-Force and broadcasting their adventures on television as a reality show. by the end of the first issue you get to know this new team just in time for almost the entire team tom die. Three characters survive to restart the team from the ground up. U-Go Girl, Anarchist, and Doop. They bring on new members Orphan/ Mr. Sensitive, Spike Freeman, Bloke, Vivisector, Phat, and Saint Anna at first with many more showing up later in the run. From there on the reader is treated to a wild ride of humor, drama, and some pretty shocking twists. As well as a long list of cameo appearances from bigger name characters like Wolverine and Dr. Strange. This omnibus contains all X-Force #116-129, X-Statix #1-26, Brotherhood #9, Wolverine and Doop #1-2 and X-Statix Presents Dead Girl #1-5. As well as small stories that popped up in various other series. Before this I had only read one other series by Milligan, Shade the Changing Man. It was that series that really showed how great he can write the stranger side of comic universes. This has to be some of the best writing from Milligan that I have found so far. The characters all have their own personalities and flaws. All the characters feel very real, and it is almost like reading an episode of the Real World. The art of Mike Allred is great. I have never been a fan of his art when he works on previously established characters, but when he works on creator owned properties like this book or Madman his art shines through as untouchable. The pop art feel fits right in on this book. As a whole this series is great, but the omnibus is a bit bulky. It comes in at a staggering 1200 pages, and nearly 8lbs.